Tomorrow night at 9pm on Food Network is the season 9 premiere of The Great Food Truck Race. 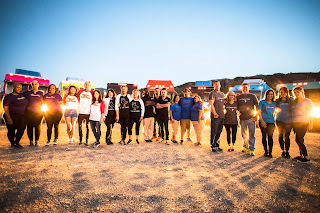 This season is in the Southwest and will have seven food truck teams who are competing to win a $50,000 grand prize. The six-episode season has stops in Los Angeles, Las Vegas, Phoenix, Yuma, Coachella Valley and then back to Los Angeles for the finale. Sassy Soul – Silver Spring, Maryland and Washington D.C. (Lauren Carson, Paris Henry, Parris Jewel). More information about season 9 of The Great Food Truck Race such as team bios and pictures can be found at multivu if you are interested. One interesting thing this year is that one of the teams (Just Wing It) has three contestants from Worst Cooks in America. I am guessing people will question the legitimacy of both Worst Cooks in America and The Great Food Truck Race because of this. When filming The Great Food Truck Race, the food trucks advertise their locations on social media (which are later removed) and local newspapers do stories on the race while it is filming. This makes it possible to determine the order of elimination down to the final two trucks. This year I do not have each elimination as there wasn't as much media coverage, but I do have the final two trucks. If you are interested in the final two, continue reading. Obviously it is a spoiler, but it just reveals the final two trucks and not the winner. Episode 4 - Yuma - The four trucks competiting in Yuma were Chops' Shop, Mobile Moo Shu, New England Grill and Just Wing It (Link). Food Truck Eliminated - Chops' Shop - Source - Someone on this forum who was following the food trucks while filming. Episode 5 - Coachella Valley - Food Truck eliminated - Mobile Moo Shu - Source - The same forum post. Episode 6 - Los Angeles - Final two Food Trucks - Just Wing It and New England Grill. So it looks like the Worst Cooks in America alumni hold their own in this competition.